Titanium dowel pins are manufactured from Grade 2 Titanium and are almost as strong as steel, with 30,000 PSI tensile. What makes these pins unique is the fact that they are 60% lighter than steel dowel pins and are resistant to high temperatures. These properties make Titanium dowel pins a natural choice for usage in extreme temperatures. Also, Titanium dowel pins are highly resistant to corrosion in seawater and chlorine, further adding to their versatility. They are slightly oversized for a tight fit. Dowel pins are machined to tight tolerances. The holes that they go into are reamed holes also with a tight tolerance. If your specific application requires different shaped and sized dowel pins, contact us and let us know your requirements. We will gladly manufacture custom dowel pins to suit your precise needs—in fact, this is one of our greatest strengths. You can rely on our team to produce the most precise, high-quality dowel pins for any application. 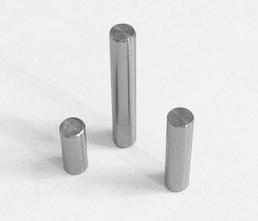 Titanium dowel pins are well-regarded for their lightweight and high resistance to corrosion. These pins are often used to align components in the research, medical, agriculture, manufacturing, aerospace, and automotive industries. Browse the Suburban Industries Catalog to see the exact product dimensions and specifications that we offer. If you are unsure of which dowel pin to choose, just ask one of our representatives for help—we can help you make the most ideal decision for your specific needs.